Despite these trying times, there is a segment of Malaysians who are recession-proof and don't mind paying for a fine and memorable meal. Especially if it's cheaper than flying to London and dining at a Michelin-starred restaurant like Chez Bruce or a swanky restaurant like Mirabelle or putting on the ritz at the Ritz. High flyers can now high-tail it to Chinoz KLCC and let new chef de cuisine Haffizul Hashim blow them away with his inimitable culinary prowess. Having spent several years in good ol' Blighty namely London, this Bachelor of Culinary Arts degree holder from Thames Valley University had his baptism of fire at the Ritz. The resilient lad then honed his skills at the Mirabelle and later, at Chez Bruce before his return to hometurf late last year. Thanks to his former bosses' glowing account, the young chef soon found himself helming the Chinoz team. Full creative licence and new kitchen gadgets were quickly granted by owner Teng Wee Jeh. Chef Haffizul of course repaid the faith by revamping the outlet’s a la carte and Degustation menus. 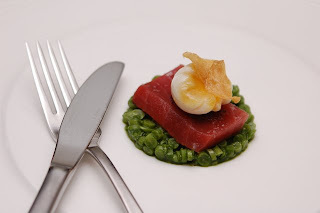 His imaginative starter of Carpaccio of Blue Fin Tuna with Green Beans Salad and Poached Quail Egg with Basil and Parsley Vinaigrette (RM42++) will leave you hot and cold. It's a special dish in which three varying temperatures – hot, warm and cold converged on one plate with each ingredient’s fresh, unadulterated nuances coming to the fore on their own instead of melding together. 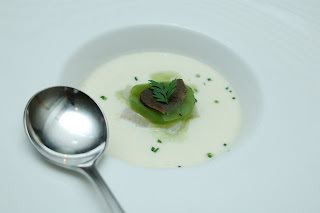 I'm a sucker for scallops and the chef's creation of plump Hokkaido Scallop with Cauliflower Velouté and Cucumber Jelly and Chives (RM42++) is simply awesome. The scallop’s inherent sea-sweetness is unmistakable thanks to the velvety smooth velouté (a basic white sauce thickened with roux, a mixture of butter and flour). The sharp, clean nuances of chopped chives and cucumber jelly provide the perfect finishing touches to this sumptuous dish. 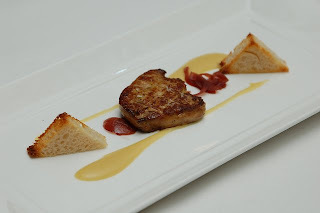 Tiny flecks of natural sea salt were all that's needed to bring out the rich, decadent smoothness of the Pan-fried Foie Gras. Paired with Sweet Corn Puree and Toasted Sour Dough, this is another heavenly speciality which earned praises around our table that night. 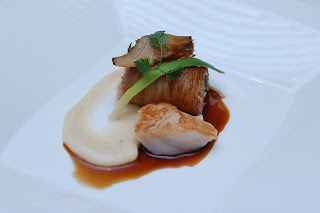 If you think fish and red wine seem like strange bedfellows, the combination of Roast Potato Wrapped Barramundi with Seared Hokkaido Scallop, Parsnip Puree and Red Wine Jus (RM68++) with ‘Tenimenti’ Barbaresco Coste Rubin 2000 is guaranteed to change your mind. Chef Haffizul said the secret lies in the parsnip's subtle flinty sweetness in drawing all the other ingredients together. 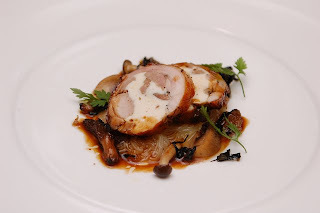 The Italian red’s sour cherries and plummy accents proved equally apt with the Chicken Ballotine with Veal Sweetbread and Sautéed Wild Mushrooms, Potato and Truffle Emulsion, Madeira Sauce. Now sweetbread (calf’s thymus gland) is not something ordinarily most local diners will devour but I admit it's difficult to discern the uncharacteristic ingredient since it's well tucked away in the chicken ballotine (deboned chicken stuffed, rolled and tied into a bundle before being braised or roasted). The deliciously full-bodied sauce of cepes mushrooms, truffles and Madeira also helps tremendously. 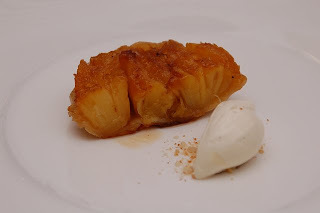 For his final flourish, Chef Haffizul serves up Pineapple Tarte Tatin and Vanilla Ice Cream. I just love the sweet intensity of the pineapple chunks post-baking so who cares if they appear less refined on the eye? You can sample all these exquisite dishes from Chinoz's latest a la carte or as a Degustation menu priced around RM230-RM250++ per head. I for one is rooting for this young and talented chef - his fresh perspective is definitely something the local culinary circle should be excited about. Malaysia Boleh! Don't you find the mound of bright orange roe a sight for sore eyes and rumbling tummies? Yes, those miniscule, slightly crunchy pearls are ebikko or prawn roe - most people mistakenly assume these as tobikko or flying fish roe which actually are bigger, more translucent and pricier. We reckon they make such an appetising adornment for the dish of seafood fried rice! I daresay this delectable dish created quite a stir with my whole family last weekend for our Mid-Autumn 'feastival'! In case you're wondering where did we partake this amazing dish, it was pure serendipity which led us to its discovery. My siblings and I were just racking our brains on where to go for our family feast that wet, wet Sunday ... since Mom has retired from cooking our festive meals, we had to find a place to eat our Mid-Autumn Festival celebratory dinner. Our regular haunt, Restoran 52 threw a spanner in the works earlier when they informed us at the last minute that the outlet won't be open for the day! So there we were, moping around and wondering when the torrents of rain would ceased when we got really captivated at the sight of the two 8TV Ho Chiak presenters scarfing down this dish of fried rice with seafood, egg yolks and fish roe which we thought was rather unique. You could have seen our jaws dropped in disbelief when it was revealed that the eatery is located in Kajang! To cut a long story short, we were out of the house in a jiffy and headed for the said outlet for dinner! Besides the Seafood Fried Rice with Flying Fish Roe (that's what the outlet called it anyway), we also ordered Deep-fried Oyster Mushroom, Steamed Tilapia with Spicy Bean Sauce, Homemade Tofu with Minced Pork, Saucy Pork Ribs, Stir-fried Long Beans with Brinjal in Sambal, as well as Shelled Prawns Deep-fried and Tossed with Mayonnaise and Coleslaw. Admittedly, we went a tad overboard but the food portions were not exactly skimpy either for our clan of seven adults and four kiddos. While waiting for our dishes to arrive, we had a field day drooling over the wall-mounted colour photos depicting the outlet's many house specialities. The dishes are imaginative and varied compared to other no-frills restaurants with selected ones requiring advance orders. More outstanding ones that caught our attention include Shark's Fin Kway Teow, Hairy Gourd Stuffed with Dried Scallops, Tofu with XO Sauce, German-style Crisp Skin Pork Knuckle, Premier Loh Hon Chai (Vegetarian Dish with Assorted Mushrooms and Layered Bean Sheets), Deep-fried Prawns with Salted Egg Yolk, Freshwater Prawns Noodles and Black Pepper Udon. Overall, the Fried Rice was a hit with everyone especially the kids. The crispy fried mushrooms were great with a piquant and tangy chilli dip but we found the fish a tad too sweet from the bean sauce which literally 'drowned' the fish. The vegetable dish passed muster as did the beancurd. Luckily the pork ribs and prawns proved memorable for their inventive marinade and sauces. But what's even better is the prices which are similar to that of Restoran 52. According to the young chap who runs the place, his father helms another outlet by the same name in heart of Kajang town by day while his uncle takes over at night. However, he told us that the three of them offer different dishes so we may have to try out the other two as well given a chance. One thing's for sure - this eatery has not seen the last of us yet!